That sleek black coat I seem to know. Why have you come here, Mr. Crow? I heard that here the water’s fine. The garden lush. The fruit divine. and swooped right in to make it mine. then bend your wing and dip your chest. You have not come at our behest. We know you rob the songbird’s nest. But I just stand here, staunch and tall. I make no movement, sound no call. I threaten no one. None at all. Your garden holds me in its thrall. do not bathe here as they please. then dry your feathers in the breeze. I watch to see what you may do. Through kitchen window, you’re in full view. watches no songbirds. It watches you. take care where you might choose to dine. The grapes you eat were meant for wine. Please stick to seeds. The grapes are mine! In garden grass, I watch for shapes. No skittering snake or mouse escapes. or take a bath while you are here. Their fluttering movements display their fear. They find your visit very queer. I haven’t been here very long. I’ve robbed no grapes, I’ve stilled no song. since I’m not welcome, I’ll move along. skirts the treetops, lands on the hedge. and takes his place on the birdbath’s ledge. Since I was traveling from the time I woke up at 4 a.m. this morning until I got home 12 hours later, this is a rewrite of a poem from 2 1/2 years ago. Today’s prompt is nest. This entry was posted in Uncategorized and tagged crow images, Daily Post, Daily Prompt, dialogue with a crow, nest, poem about crows on November 21, 2017 by lifelessons. birds has great meaning in our life and adventure, they carry for us a message or hint!!! I’ve always had an affinity for birds and fish. Don’t eat them… just love their images and metaphoric significance. Thanks, Angela, for reblogging, and in the correct manner! I really enjoyed your clever Crow poem Judy. I love your simple/complex rhymes full of dry humour. 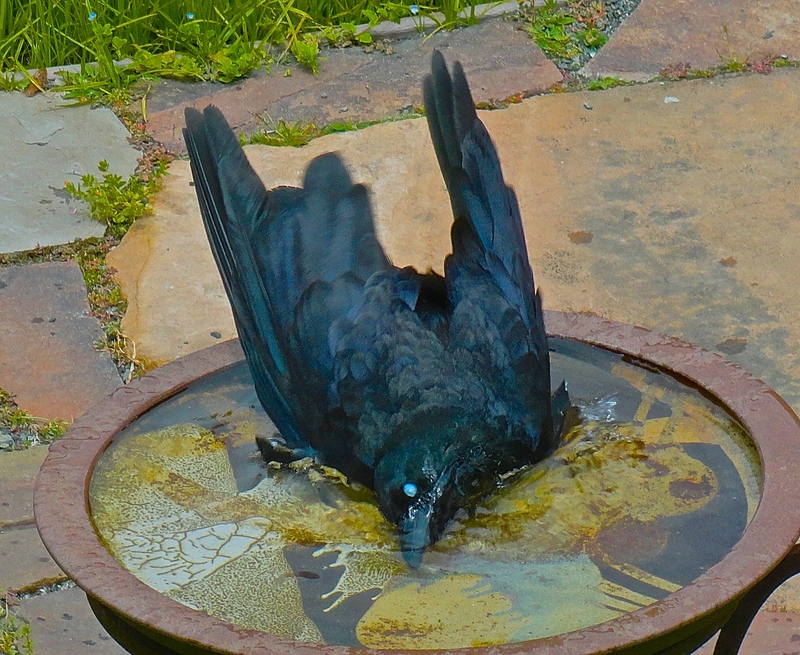 We have a bird bath with the same crow issue – although it did not deign to converse with us. You haven’t learned Crow, md? Haha! You give lessons Judy? Caw! Caw! It’s an extrasensory affair, md! I can give lessons in that. Do you teach duck too? Quack! Quack! I majored in Duck. My name for forgottenman is Duckie and of course there is Little Duck. Have you seen his stories? Wow! You are now my primary duck resource! I rate you Two Quacks. 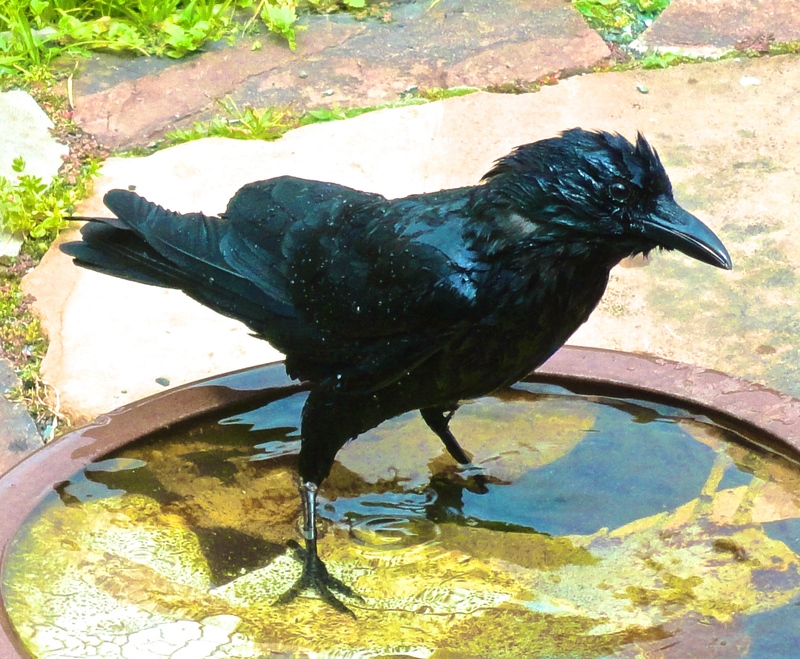 (Instead of Two cows) BTW – I just read your Mister Crow poem to my wife – we had a good laugh! She does talk to Mister Crow. Love your crow poem, Judy. They are a strange type of bird worthy of telling a quirky story or two about. You captured their mysteriousness well. Thanks, Shelley. Along with bluejays, they are such problem-solvers, but pretty lethal regarding the population of smaller birds. But, that said, I’m fascinated with them, too.